There is no need to devote excess time or spend tons of money on expensive products to keep your face clean and healthy. Choose from a few simple facial cleansing tips and pick products that won't damage your skin to keep your face smooth, glowing and youthful. Whatever your skin type, apply a small amount of a light moisturizer to your face after cleansing to lock in moisture and serve as a protective barrier. Whether you use a creamy, foamy, or oily cleanser is a matter of preference. However, according to Skin Therapy Letter, a liquid cleanser is better for facial skin cleansing. People with normal skin have a wide variety of products to select from that can leave skin feeling smooth and soft. For others, choose a product that is tailored to your skin type or consult your doctor if you have a troublesome skin problem. For oily or acne-prone skin, you can use a facial cleanser with 2% salicylic acid. According to the United States National Library of Medicine, salicylic acid unclogs oil pores and softens and loosens dead skin cells that cling to your face. For a cleanser with salicylic acid, try Neutrogena Naturals Acne Cream Cleanser. If your skin is dry or sensitive, choose a cleanser with emollients such as glycerin or other moisturizers that wont dry your skin. You might like Neutrogena Ultra Gentle Daily Cleanser with glycerin. If you have combination dry and oily skin, try a a facial cleanser that combines the benefits of a skin clearing agent and a moisturizer. Olay's Foaming Face Wash for combination skin is a good choice. There are many other great cleansers for all types of skin so you shouldn't have trouble finding one that works for you. A study of the effect of temperature on pig skin was published in Biochemistry. The results suggested that temperatures above 70 degrees Fahrenheit disrupt the barrier function of the skin's surface, making it easier to lose water. Another study on human forearm skin published by Contact Dermatitis suggests that higher temperatures increase the potential of cleansers to irritate the skin. Therefore, repeated use of hot water might lead to dryness and irritation of your face. Give your face a deeper cleansing by exfoliating your skin. It removes dead cells that should slough off but instead cling stubbornly to your skin, especially as you age. Exfoliation exposes the newer cell layers, helps unplug your pores, improves skin texture and tone, and gives your skin a healthier glow. Protect your skin and avoid irritations or abrasions by exfoliating no more than once or twice a week. Choose a gentle product without rough scrubbing particles. 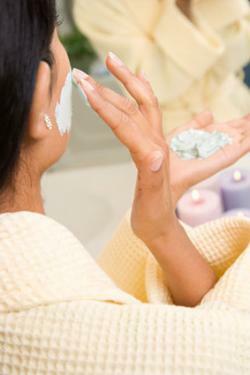 Products with 2% salicylic acid or alpha hydroxy acids, such as glycolic acid, are good exfoliating or peeling agents. Try Clearasil Ultra Rapid Action Face Scrub with 2% salicylic acid or Ponds Exfoliating Renewal Wet Cleansing Cloths. As an alternative you can exfoliate your face with a soft wash cloth. A facial scrub brush can help you apply cleansers and exfoliators more thoroughly to your face. It helps you remove dirt, oil and dead cells efficiently and increase skin circulation. However, according to an article in the New York Times, dermatologists have mixed opinions on the use of a facial brush to cleanse the skin. Some feel that a brush gives your face a deeper cleanse while others feel your fingers are sufficient. Use a brush no more than once a week to avoid damaging your skin. Gentle application is key to prevent skin damage - let the brush do the work without applying extra pressure. Wash your face well after applying your chosen product with the brush. Don't use a brush if your skin is irritated. Use a brush with care if you are using potential skin irritants such as retinoids, salicylic acid, or glycolic acid. Look for products with soft brushes rather than flat abrasive pads. Many facial skin brushes come with a timer you can set to keep track of how long you spend on each section of your face. Consider Proactiv+ Deep Cleansing brush for a moderately priced product. Whether you use a commercial cleanser, an oil, a scrub brush, or an exfoliator on your face, you don't need to rub your skin hard to clean it. According to the American Academy of Dermatology hard scrubbing can irritate your skin. Be most gentle with the delicate skin around your eyes. Use products or devices gently so you don't damage the outer layers of skin cells, fatty acids and ceramides that lock in moisture and protect your skin from the environment. After you wash a product off, pat your face dry with a soft clean towel. Gentle application of cleansers is especially important for people with skin conditions and for those with darker skin who are prone hyperpigmentation. The idea here is that steaming your face increases blood flow to your skin and can soften hardened oils that plug the openings of your pores. This will decrease your chance of skin inflammation, infection and acne. According to Allure magazine facial steaming both softens and hydrates your skin. To enhance the experience you can add herbal teas or a drop of your favorite essential oil to the water. Put your hair in a ponytail and keep the front back with a headband. Bring about six cups of water to boil and pour it in bowl. Make a tent over your head with towel and hang your head over the bowl for 10 to 15 minutes to steam your face. Wash your face and pat dry with a clean, soft towel. Apply a moisturizer to seal in moisture at the end of your steaming. Like everything else you do to your face, be gentle and don't overdo it. Steaming once a month is probably sufficient to reap the benefits. If you have a skin condition check with your doctor before you do a facial steam treatment. It is easier to wash your face and keep it clean and healthy if you first remove your makeup every day. No matter how tired you are, don't go to bed with your makeup on. It clogs your pores and encourages bacterial growth, which makes you more prone to skin inflammation, acne, and eye infections. 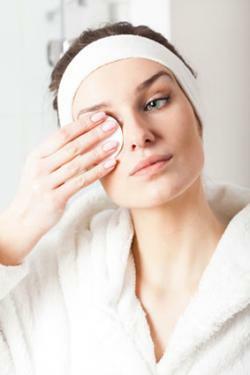 Use gentle makeup removal products that do not contain alcohol, fragrances or preservatives that may irritate or burn your eye or eyelids. Olay's Wet Cleansing Cloths are a good choice. If you prefer a liquid product, try Neutrogena Naturals Fresh Cleansing and Makeup Remover. Cleanse your face of makeup soon after you get home and let your skin breathe, even if you are not ready to shower and do your nightly facial care ritual. Protect your skin and keep your face healthy with proper cleansing methods and products. It doesn't take much work or time to clear away dead skin cells, excess skin oils, environmental pollutants and organisms that clog your pores and irritate and age your face.